Located in the center of Ohio just north of Columbus, the City of Delaware is home to a population of around 38,000 residents, a robust light industrial/ manufacturing base, Ohio Wesleyan University and a charming downtown shopping district. 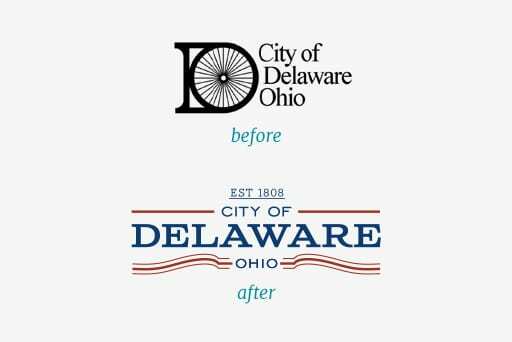 The City of Delaware has experienced unprecedented growth and stability. Its blend of small town charm and big city amenities makes it the perfect home for residents and businesses, in addition to a great getaway for urbanites seeking the serenity of this suburban sanctuary. While the city was doing just fine, they wanted to stand out even more. With their sights set on continued development and economic vitality, they asked for our help with a new wayfinding system. But, we ended up doing a little more – starting with a new brand first, followed by a new wayfinding program. Immerse ourselves in the City, spending two full days with multiple stakeholders to identify goals, audiences and positioning. Driving and walking tours were conducted, along with intensive Discovery Workshops – one focused on Brand and the other on Wayfinding Experience. 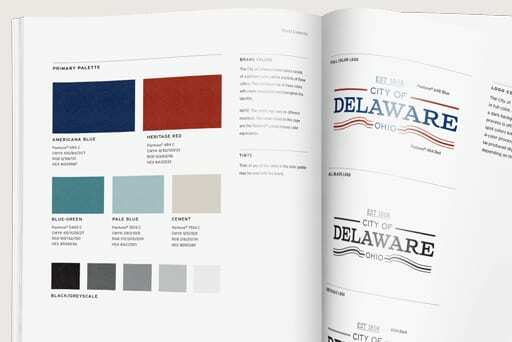 Create a brand identity that preserved the City’s authenticity as a small American town with major attractions and amenities. The new logo triggers nostalgia and pride with its classic, Americana vibe. Along with the logo, “Traditions Badges” highlight the city’s eclectic attributes and can be used in a variety of marketing communications pieces. Develop a wayfinding program that is infused with brand character and prioritizes getting people to and from the historic downtown district. Following the downtown neighborhood, we’ll take a phased approach to implementing wayfinding throughout the rest of the city, including its public park system and business corridors. Provide the City with brand guidelines and robust sign standards to help officials expand and implement future phases of the program. 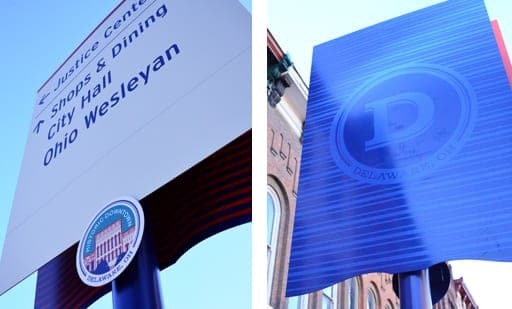 City of Delaware realized the value of starting this journey with their brand and augmenting it with a well-connected wayfinding system that creates an ideal user experience. Since Phase 1, Guide has created an extension of the sign program in the form of standards for the City’s park system and industrial corridors. Now that these assets are finalized, the City has further cemented itself as an ideal destination and is positioned to pursue more economic opportunities than before. City officials and residents have applauded the new visual personality that has added even more allure to this picturesque town. What is a Brand Strategy, anyway?